The second you walk into The Other Art Fair, you realize you’re not in for a typical gallery experience. At every turn, you find something unexpected, immersive, inspiring and — maybe most surprisingly — affordable. Presented by Saatchi Art and technology partners like Dell, each edition of The Other Art Fair showcases work by a selection of talented artists who have been handpicked by a committee of art industry experts. The goal is to help art lovers meet and buy directly from the very best emerging and undiscovered artists in the world, while experiencing their art in an exciting and immersive way. 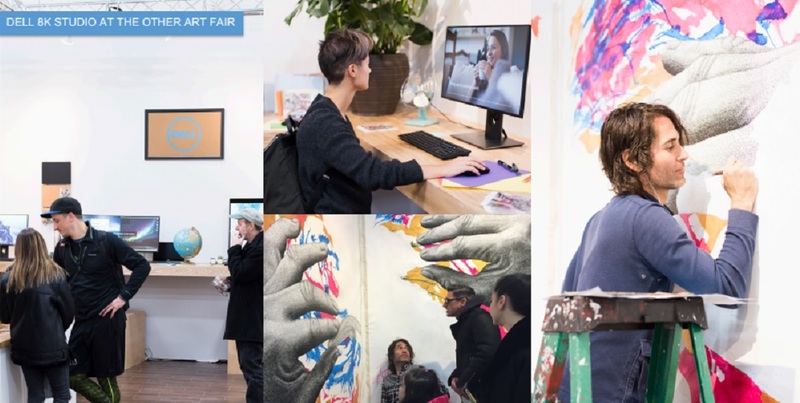 We were honored this November to participate in The Other Art Fair in Brooklyn, New York in partnership with emerging Northern Californian artist Bryan Valenzuela with our own Dell 8K Studio space. As the world’s first 8K monitors, these screens provided the visual impact of 33.2 million pixels and 280 pixels per inch (ppi) density. To give you a point of comparison, this is a level of breathtaking realism that displays 16 times more content than full HD and four times more content than 4K monitors, making Valenzuela’s art come to life in extraordinary detail as guests zoomed in and of his works to admire and appreciate the level of detail contained within each piece on their own terms. Additionally, Dell’s 8K monitors display color depth of 1.07 billion colors, a whopping 64x more color depth than standard monitors can provide. 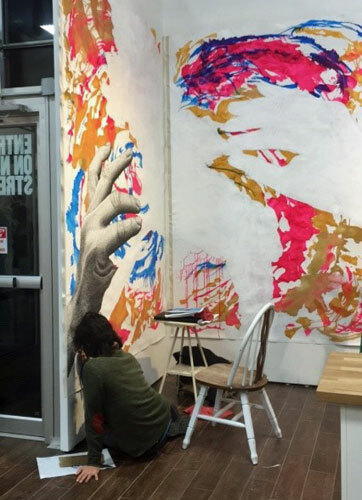 In tandem, Valenzuela created a new wall-sized mural throughout the weekend in real time, showcasing his unique style of building upon small handwritten words to create large-scale, complex images. Through the combination of live art and immersive experience with the monitors, guests got a unique view of the entire lifecycle of Valenzuela’s art – a one of a kind experience. We were honored to work with Valenzuela to provide this experience as part of our commitment to pushing the boundaries of innovation. We believe our position as a leader in the tech community is inextricably connected to our continual celebration of creativity — in our own product development, in the cutting-edge experiences our products enable, and in the creative work our customers perform using our products. The Dell 8K Studio also showcased the Dell UltraSharp 27 4K HDR Monitor, designed for video-intensive work, as well as the Dell UltraSharp 38 Curved Monitor, designed to boost productivity. Whether you create art, collect art, or just want to view art in new ways, we’re here to power those experiences in ways you’ve never imagined.